As we will show, the stock market is currently extremely overvalued. As in 2007, we strongly advise liquidating equities. Reasons to sell two years ago included: an optimistic market, large insider selling, and low cash holdings in mutual funds. These three indicators are currently back to or above 2007 levels. With regards to current sentiment, Investors Intelligence’s newsletter survey shows optimism is back to peak levels. Likewise, The Daily Sentiment Index (shown below) shows that traders are more optimistic now (89% are bullish) than they were at the top in early October of 2007.
Insider selling is also back to levels not seen since the top. Similarly, the cash percentage of mutual fund holdings is close to historically low levels. Mutual fund managers are not worried about investors cashing out; instead mutual funds are receiving record inflows from the investment public. When the public rushes in, it’s time to be rushing out. These esoteric characteristics, which assisted us in 2007, are warning of a significant top. It’s as if the 2008 meltdown never happened. As highlighted in Derivatives Say Bernanke Will Be Wrong, the residential mortgage index from Markit (ABX.HE), implied ‘continuing large losses’ of not only subprime but A-rated loans. With optimism eclipsing levels seen in late 2007, investors are once again blinded to risk, this time in the commercial mortgage market. As mentioned in What the Bankers Know, there are over $1T in commercial loans maturing over the next 3 years. But forget about refinancing. 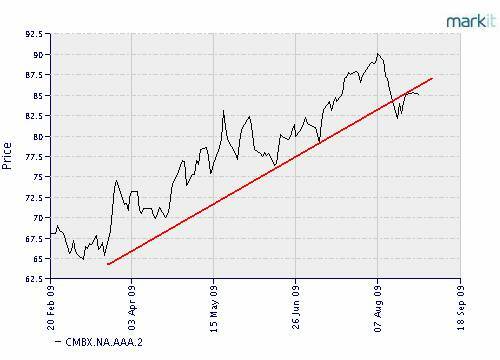 Instead, existing Triple A-rated commercial mortgages (from Markit), have recently broken down from their uptrend line. After its peak in October 2007, the Shanghai Composite Index fell roughly 70% last year. Zhang, a 59-year-old laid-off autoworker complains to the AP: "I have most of my money in the market, and now I feel so sad, I want to cry…and the government said they will protect small investors, but actually our interests have been hurt most." The Chinese market after a fierce rally has recently cratered 20% in one month. U.S. investors should heed the warning of Zhang: "I used to have money to buy a two-bedroom apartment, but now I can only afford a toilet." As we explained last July, "We look forward to selling near the next bear market rally peak." We suspect this is it. Let us state again, “Therefore we hope you are able to shrug off the need to follow the crowd, look at the evidence rationally, and protect your assets.” We have set ourselves up for another rough fall. The decline should be fast and furious.